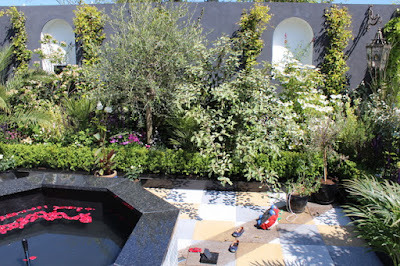 Some gardens were well manicured and presented as kind of outdoor relaxing rooms. For many people this is what they need and desired. Other gardens were a kind of living installation art, that few of us would desire to create for our gardens, though they did attract a large 'wow' response from many people. The third type truly expressed my bias, as these were the gardens that attempt to imitate nature and be as close to it as possible. 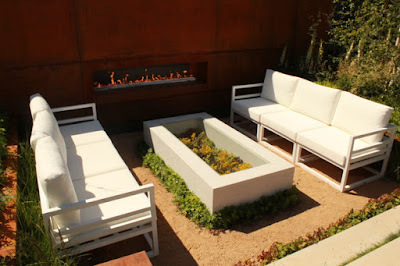 They were rugged, somewhat uncontrolled, yet still a garden fitting into a specific garden area space. I humbly admit that it is with those gardens I did spend most of my time and took the most pictures of. 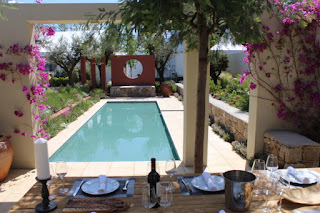 For this blog I have created my review of 24 Gardens. 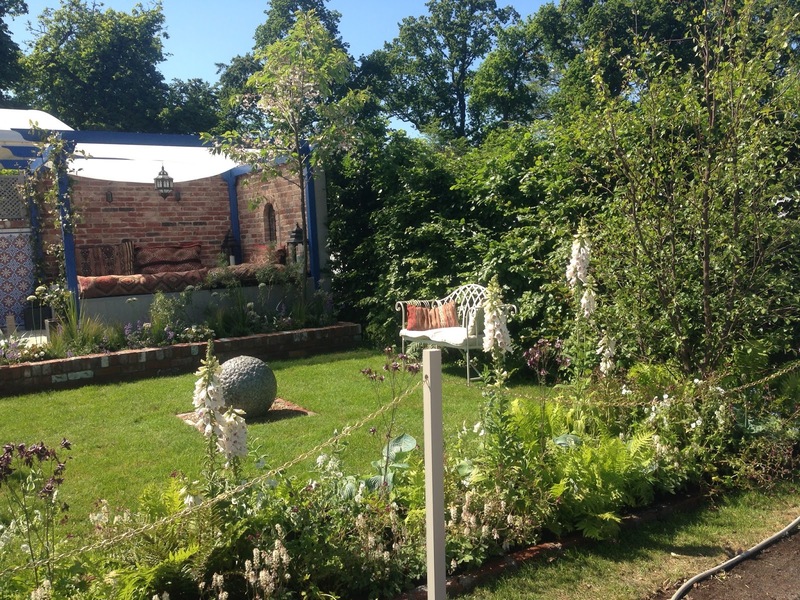 23 gardens are the Show Gardens plus the OPW Walled Garden that is always there, that I was very impressed with. Sponsored by Irish Independent, Bord Bia and Dublin City. I gather the sponsors got together with the idea of showcasing a 1916 Celebration Garden. 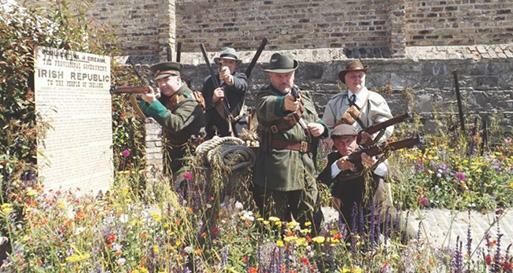 They set up a competition inviting gardeners to present their ideas of how to present 1916. Fiann got the job, a gardener who has presented at Bloom every year during its 10 years. The theme was of children daring to cross the crossfire of bullets during the fighting to loot a sweet shop of its sweets. The multi colour of the beautiful selection of flowers in the garden represented the different colours of the boiled sweets. Through this Fiann attempted to express the question of whether the promise within the Proclamation to 'cherish the children ...' has been fulfilled. Strangely, this garden did not seem to win a medal? I thought it was worthy of Silver or Gold myself as it was incredibly well displayed. I will not say much of this garden now as this is where Claire Roche and I performed, so I am writing an additional seperate blog post about this garden and our experiences here. 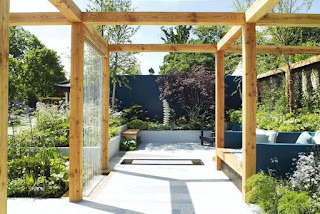 The idea of this garden was to show an example of a space for meditation, mindfulness and retreat that could be created in a very small urban garden and be easy to maintain. This garden was awarded a Bronze medal. I thought it was worthy of Silver, myself. ... and an army of small plastic gorillas. The garden was mesmerising for all, and enjoyed by children, especially. Not the sort of garden you would create at home, but a smaller version may work in the lobbies of movie theatres showing the film. Another plus was a 'model' who looked like the movie Tarzan with bronzed tanned body, Robert Plant style wavy hair and shorts. Women (and men) took to having selfies taken with him for their Instagram, Facebook etc. accounts. 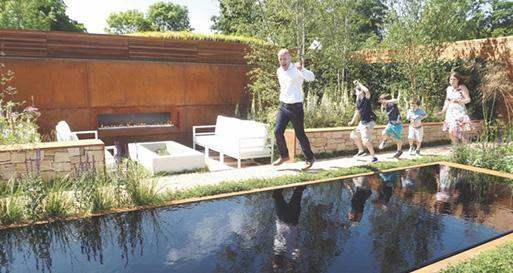 This garden was awarded a Gold medal, which surprised me. 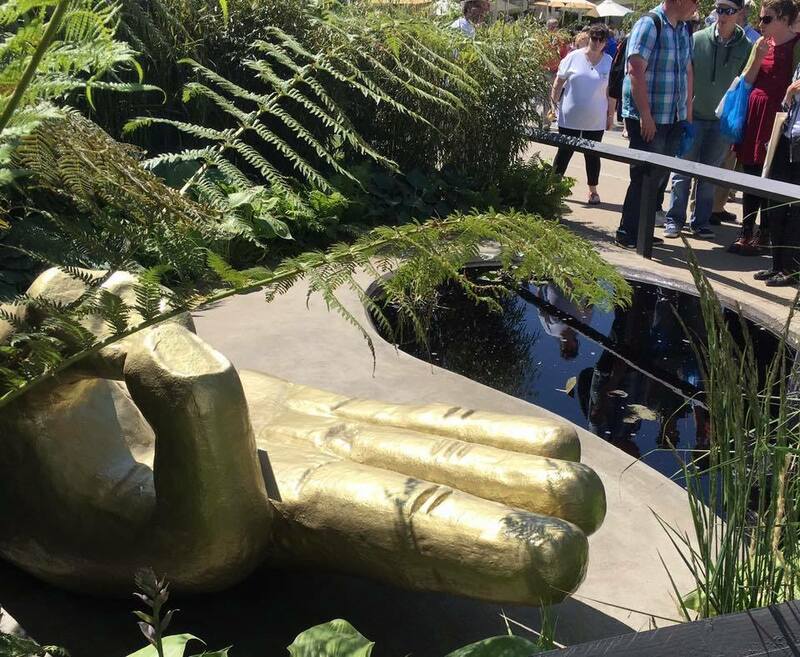 Though fun and surreal I thought there were other gardens here more deserving of the Gold that did not receive it. Even so, Liat and Oliver did a creative job here, so congratulations to them for this. 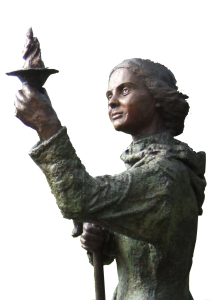 Sponsored by St. John Of God and Irish Association For Counselling And Psychotherapy. 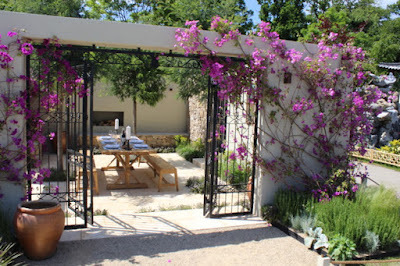 I was awed by this garden, but somehow did not take pics to share with you? The garden was beautiful but also intense as it was created to illustrate the sufferings and frustrations of people suffering from mental health issues. The centre installation was a giant seesaw full of graffiti splashing the anguish from those afflicted with mental health challenges. A dense collection of trees spoke of the dark depression of many of the mental health challenged. Spiky, thorny plants illustrated the defence from the rest of the world that the mental health challenged find hard to cope with. Loose gravel served a symbol of instability. However, at the front of the garden was bright beauty with colour to reveal that it does get brighter and hopeful when there is help for the mentally challenged. 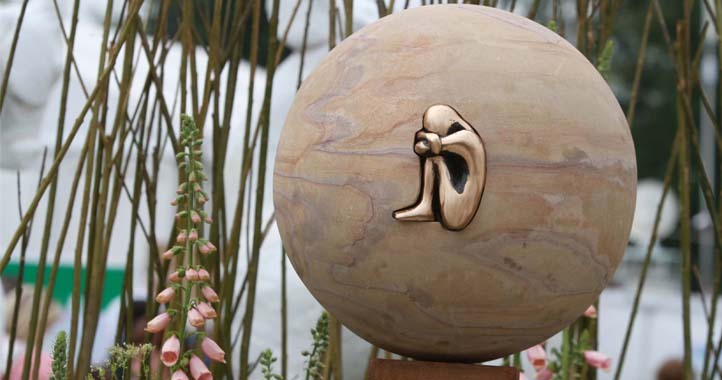 Somehow, I feel this would have been better placed next to our Tao Of Now garden, which is a space where mentally challenged could find some ease, clarity, acceptance, and unity. Padriac has moved this garden to Saint John Of God hospital near Stillorgan. 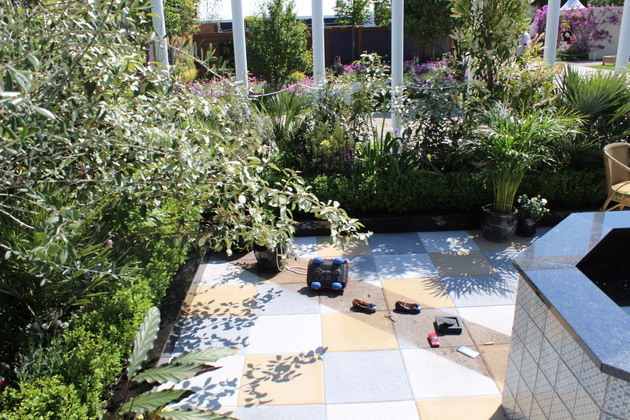 This garden was awarded a Bronze medal, congratulations. Another surreal creation from Liat and Oliver. Designed as a retreat garden for garden designers. to sit within or stare out through windows. A very pretty garden with beautiful water features. There was a refective mirror at the back of the garden and windows that passers by could look through to see the garden through windows. Lots of thought here, and I am surprised I did not take a surge of photos of this garden. 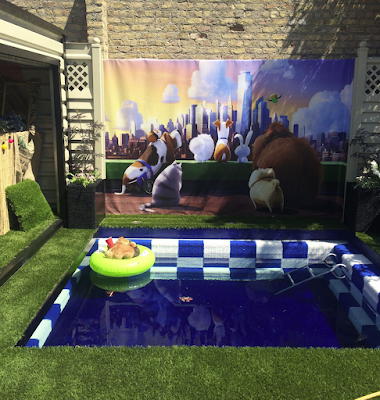 Sponsered by the Secret Life Of Pets movie, Universal movie makers and Sanctuary Synthetics who make artificial garden stuff. Totally surreal garden, and I wondered if it was actually a garden. 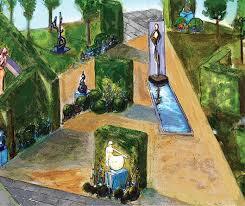 Visiting children adored this garden, but I could not make much sense out of it and did not take pics. 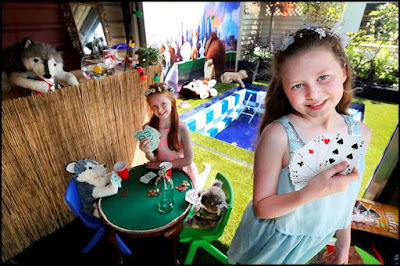 There was a fun story out of this telling the story of this being a garden where pets changed it around to make it their own. Then they changed it back again to how the humans had the garden before. Was awarded a Silver medal. Though I did not 'get it' here, it probably did deserve this award. Another contemporary garden where I 'did not get it'. It was a bright cheerful garden around a light bulb. Using a garden to market, or at least bring attention to, Solus Lightbulbs was indeed a clever thing to do. Onto the first of the medium size gardens now, and this seemed to be the kind of garden that most people dream of having. The Glasnevin side uses red brick bricks once part of Dublin's Georgian and Victorian houses. There were lovely trees, beautiful relaxing seat, lawn and some ornaments while the Granada side featured a small garden inspired by peaceful summerish Islamic gardens that Alexandra saw in Morocco. Why I did not take pics of here baffles me, as this was a beautiful, relaxing and even pollutant reducing garden. Perhaps it was the impression of there being too much lawn, but now that I think of it, this garden was really very good. Sponsors unknown, was it the hospital? This was a lesson, to me, to read up on the garden design and it's intent before coming up with my own conclusions. To me this garden first looked like a beautiful garden that was totally ruined by a hideous ultra modern techie summer house in the middle. 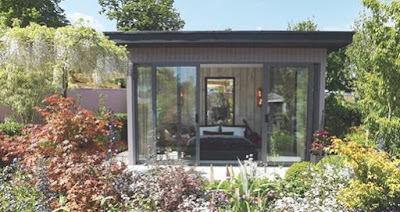 What this was, was a convalescing room that extended into a beautiful garden to serve a more healing environment than a sterile hospital ward. Considering the garden this way, after reading the notes, and here we had a beautiful miracle garden ... that I took no photos of! My first reaction here too, was there was too much lawn, but I do not have pics of that. The lawn purpose here was to give a soft link to the rest of the garden and encourage easy access for the 'patient'. 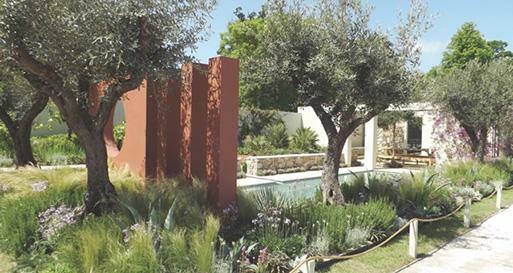 The first of the large Show Gardens was rightfully awarded a Gold medal. A medium sized garden. I stopped by here a few times as it took awhile for me to get a sense of what this was about. My first reaction was that it featured too many squares. 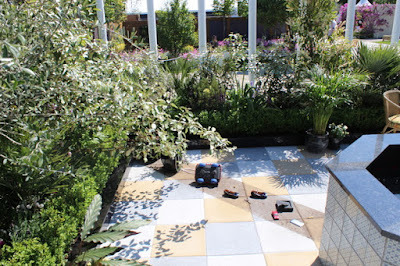 One thing that was starting to irritate me about some of the show gardens was the projection of rectangles and squares. Sometimes there seemed to be too much obsession with having 90 degree angles everywhere. I love to see lots of curves within gardens. I find that much more relaxing. After awhile I found myself forgiving this garden for its 90 degree obsessions, and began to love it. 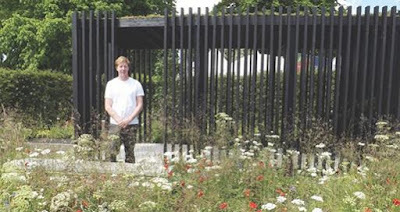 Actually, there were lots of curves, in the willow weaving of the raised beds lush with veggies and flowers. Beautifully done, and much neater than what I do. So, I also learned something here. 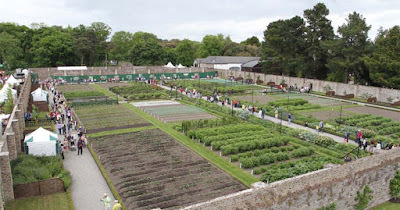 Apparently this garden is going to be part of the current restoration of Bremore Castle Balbriggan, so I found myself being happy that they shared this with us here. This was awarded a Silver Gilt medal, whatever that is? Glad it received something of merit to honour this class garden. 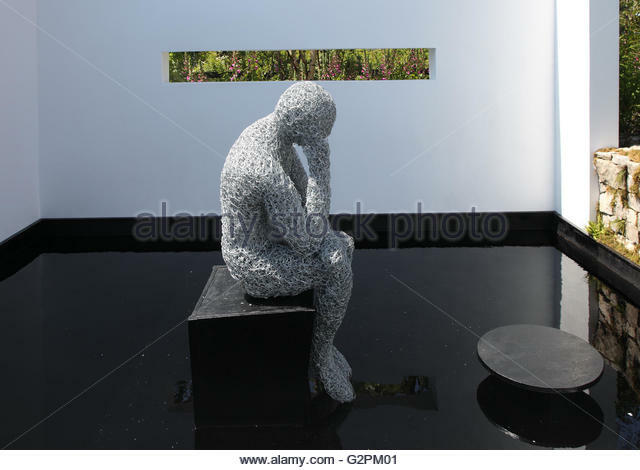 I regret to say that this was a garden with all of the finest elements that a relaxing healing garden could have ... but all arranged into incredibly precise rectangles, squares, and seemed like a complete honour to the neat and tidy ninety degree god. 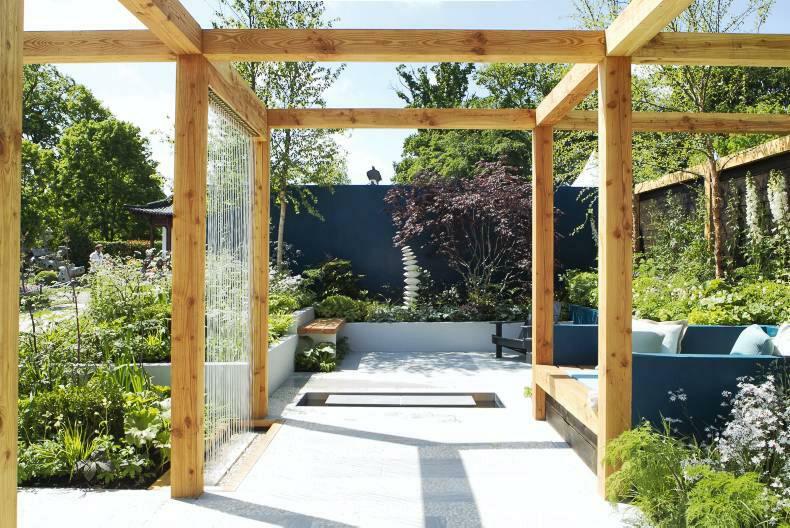 Described as a contemporary interpretation of an ancient Sanctuary garden with the intent of having a positive effect on our mental and spiritual well being. I agree that the presence of beautiful trees, water feature and well blended plant and flower colours, which were all here, has an amazing healing ans sanctuary effect on us. I was surprised that the garden was described as being non linear as all I could see up front was endless 90 degrees, the meeting points of illusively neat beginnings and ends. 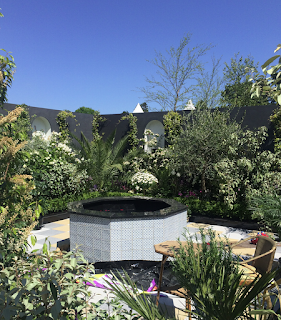 This garden may have frustrated me but the judges loved it. It worked for them. This garden was awarded a Gold medal. Aaahh, this was a very, very special garden. Sorry I did not take more pics. Perhaps I was just too moved to bother with photography. With Marie Keating Foundation being a sponsor this is obviously a garden of hope for people affected by breast cancer, but lets put that challenge aside for a moment. The use of pink was very interesting. Some of the ideas used could have seemed to be, and was, very plastic. cliché, and even too sweet and sickly to look at. I do not know how she did it, but Tunde created what could have been a yukky disaster into a very integrated surreal beautiful garden of presence. 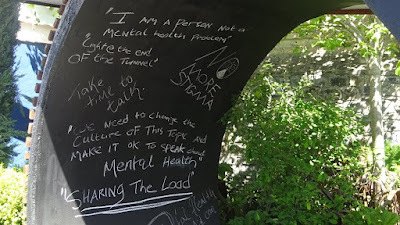 There was an invitation to include ribbons of dedication to people we know afflicted with breast cancer, and this was handled like the placing of rags and cluties on sacred trees, though at this garden no trees were harmed. Lots of dark purple and pinky red flowers and plants that touched our emotions here, but these flower beds flowed into light pinks that stunningly transformed dark emotions into light and hope. Overall this was a garden that oozed out compassion and love. 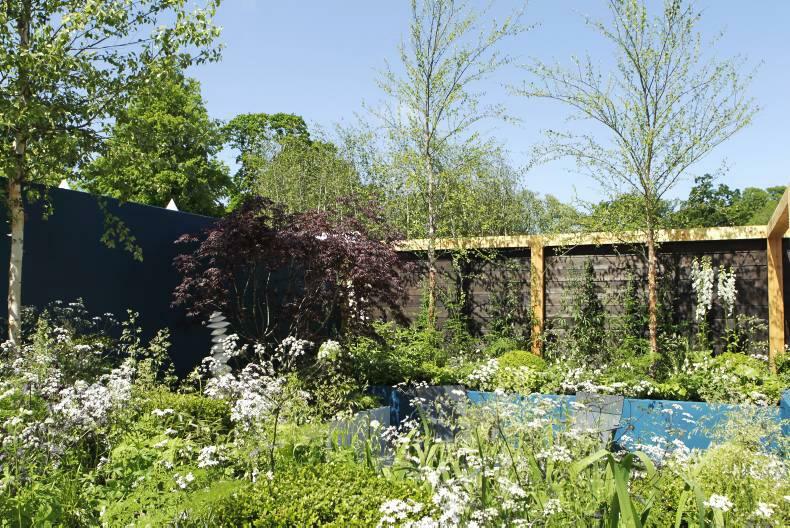 It was a awarded a Silver Gilt medal. I think this should have got Gold! This garden was one of the most popular with many many people. Several people spoke to me of this being their 'dream garden' but this was another garden where I 'did not get it'. Andrew, the designer and creator, beautifully described this as an escape from social media and reminds us to connect back with nature and the interactions through the presence of real people. Within this garden was a table and easy chairs, beside a fire on one side, and a calming pond on the other side, that many thought was very cosy. Uuggh, its all that rectangle and 90 degree stuff everywhere that got me again! Rectangle table, rectangle pond, even rectangle fireplace that looked like one of those fires that is operated by a remote controller. 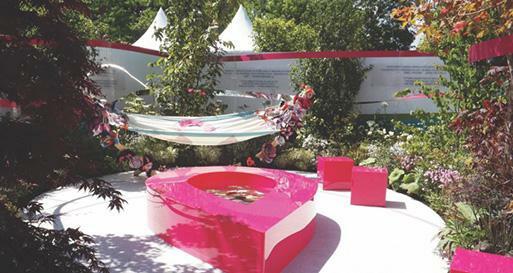 Lovely trees, lovely flowers, lots of space and beautiful ideas for connection and fellowship ... but please bring in some relaxing curves and spirals. A delightful barber shop quintet sang beautifully here too. 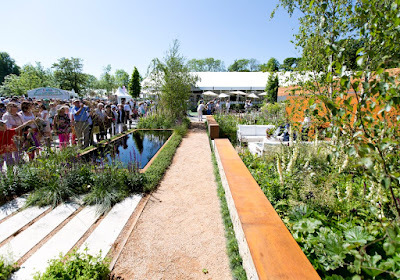 The garden was awarded a Gold medal. 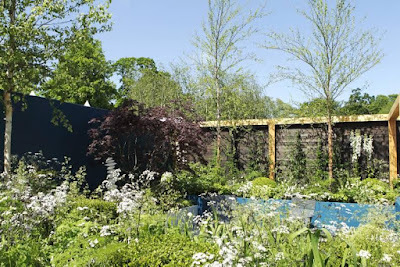 Perhaps the most ambitious garden of the Show Gardens, created in Chicago and shipped over to Ireland. For all of that, here was another garden that baffled me. Its concept was very surreal, two curving bridges, described as peninsulas, that do not connect yet creates an anticipation of connection. This was really surreal installation art rather than a garden. I think the two bridges contained a single species of plant in each and below was a lawn with reflective square and rectangular transparent sheets. I found this garden to be very odd, but it was awarded a Gold medal. I applaud Matthew for achieving and sharing this vast project though. 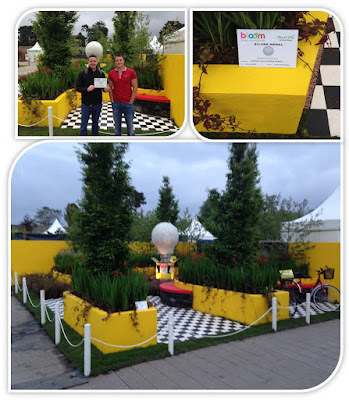 Sponsored by DJ Landscapes, Chef Sauce, Sap, Gardenworld Nurseries, Cuprinol, Garden Shades, Growise, Bord na Mona. Wow, what a lot of sponsors for a medium size garden entry. This was a garden of several elements and lots of pleasantries and did have a feel of being very Irish. Features included a crackling fire, bubbling water, beautiful plants ... but, alas, lots of 90 degree rectangle features that could have been curved and circular to relax it more, such as the central fire pit and the water feature. Was awarded a Silver medal. Despite my 90 degree angle complaint, I still think this could have had Gold. Dramatic intent was here to focus us, even shock us, into a comparison of peaceful bountiful Syria with the war torn destructed Syria today. As a garden, I think I really avoided it. I am glad it was here, but personally could not accept it as a garden presentation. It is now being assembled at the reception centre for Syrian refugees at Monasterevin. Inside I am feeling that if I was a refugee I would prefer to be greeted by the Blurred Lines garden I have just just mentioned above, or the incredible Across Boundaries garden I have yet to review. A garden that had a strange impact on me. It looked like it had beautiful potential, but was unfinished. There are elements of ancient construction and mythology here, with the Birch trees revered as the foundation trees of a forest. Where birch seed and grows, a forest is created soon. Put birches in a circle and we have a kind of ritual sanctuary. Within the birches was a henge, a well manicured lawn type, like the manicuring that is done at come ancient sites such as Newgrange, Fourknocks and Grange. With such manicuring I question what this has to do with nature as it seems to be more of human obsession with neat and tidy. 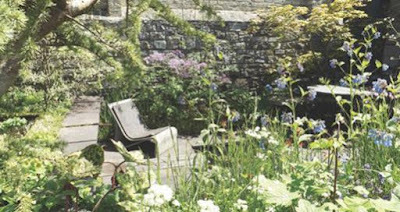 Then there is the pool in the middle, that causes me to think of holy wells, and the stone seat being representative of benches sometimes found at such places. I find myself reminded of the Kevin's Well at Glendalough, a small well with a small henge around it. Beside this is a mature birch tree, but a local nun cut off the lower branches to discourage the hanging of prayer cluties and rags. Hugh described his garden there a being a place to go to relax, and through being centred to be a place where we can discover, through thought, who we are and what we want from life. Hugh Ryan described this garden as a place of reflection. I find the ideas are stunning, but its all to perfect, a human quest for perfection. I would prefer this idea with elements of the unexpected. 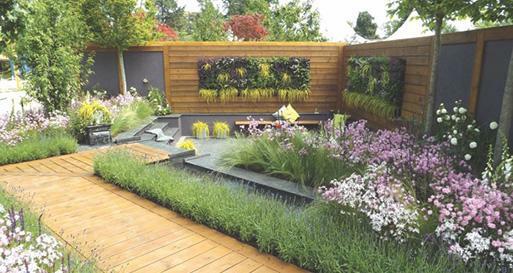 This garden was awarded a Silver medal, and it did deserve that. One of my favourites of Bloom 2016, I think my third favourite here. With this garden we walked through half of a billion years of plant evolution on this planet. This first section is an interpretation of the earth before land plants. Onto plants developing vascular systems for lifting nutrients from the ground, and sending them back down. 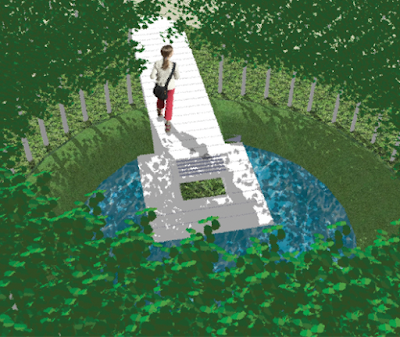 This garden is now being re-constructed as a permanent outdoor classroom in the grounds of UCD so that it can be used to teach plant evolution and diversity of plants on Earth. Another garden that left me a bit confused as it had some beautiful wonder that, seemed to me, tarnished by being mixed in with modern linear cubic carbuncle. 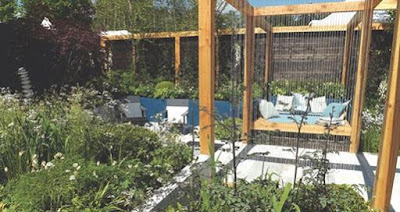 James seemed to approach the concepts of modern carbuncle cubic architecture as being our 'everyday environment' and aimed to express how to integrate that style into a sustainable relaxing garden space. 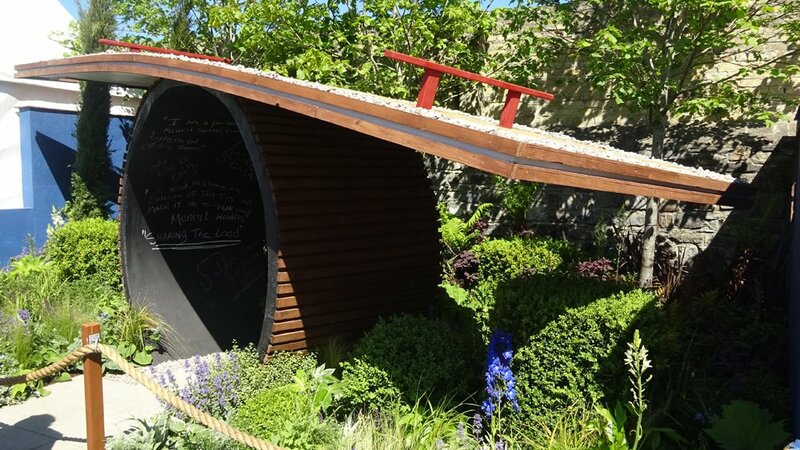 This was my clear favourite garden at Bloom 2016, and a seeming miracle how it got there. The start of this was a spare room, with a cold, empty, melancholic feel, with a statue of a figure not feeling great about it either. Sculpture was created by Gwen Wilkinson. From this we entered into a beautiful meadow full of lush grass and abundant wild flowers. 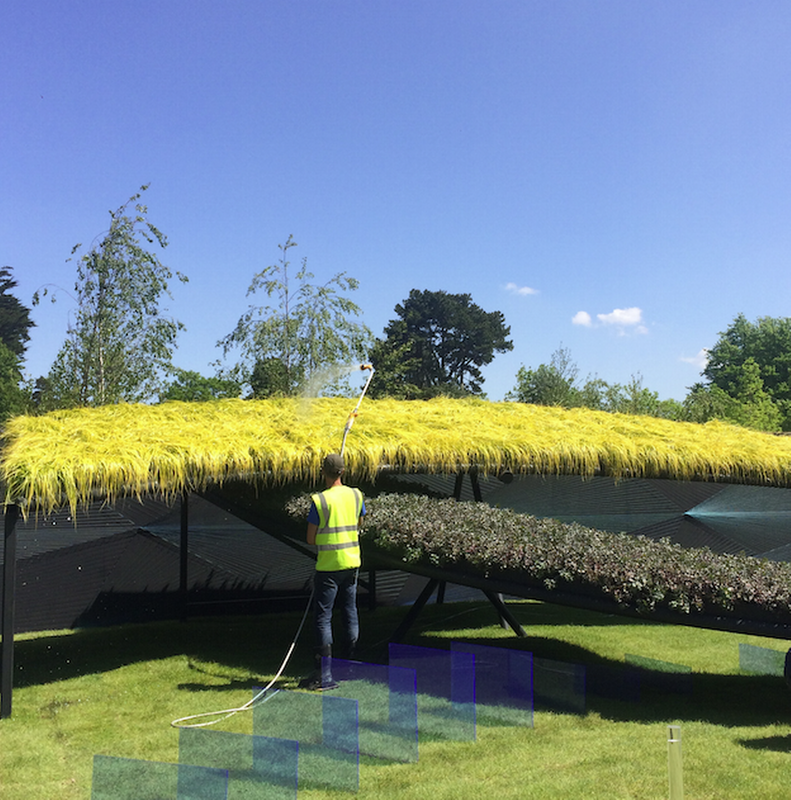 How was this achieved at Bloom for Bloom? Apparently, a meadow in Co. Leitrim, near the Fermanagh border, was carefully dug up as turf squares, set out at Bloom, and when finished, returned to where they came from and put back. What a task! Note the Gwen Wilkinson sculptures of farm animals. The whole garden was interpreting the story of Social Farming as a vital role in therapy. The sad figure in the cold room is in a room representing conventional therapy. It expressed the mood of places where we send people to, where they stay in lifeless institutional rooms. In this interpretation the figue is invited to enter into the open field, and go through the gate of the wall, the barrier. The figure has then taken the transition into traditional naturalistic small farm therapy. Social Farming is the practice of offering activity on family farms as a form of social support service. A Social Farm is not a specialised treatment farm as the farm remains a working farm at its core but it invites people to participate in the day to day activities of the farm. 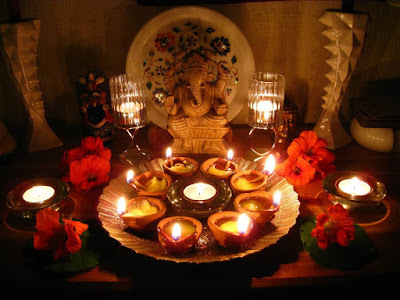 Its a growing culture of social integration. The creation of this garden for the show is a huge wonder. The rocks and other components were shipped to Ireland from Yanzhou City in China. Apparently, Yangzhou has a tradition of rockery gardens. My feeling was this garden was too perfect, perhaps sometimes too cliché, and even a bit Disney world like. I feel it needed a bit of weathering to come alive. This harp was only on display on the Thursday, probably because the heat was too much on it's wood. The whole garden, including the building wall construction behind, is being re-assembled within Herbert Park in Dublin as a permanent feature, as a gift from the Chinese government. While in Herbert Park I am sure it will get the weathering, that I mentioned earlier, and look wonderful there. Alan Rudden seemed to be the gardener brought in if a garden was really an aid to sell a product. He mastered the Solus light bulb garden, and here he masters the Santa Rita wine garden. This was a huge favourite with many visitors as it tapped into their desires and passions for a sort of lottery winning Club Med. kind of lifestyle, though this theme is actually based on South America, Chile, I think. Again, for me this was too much about squares and rectangles. Far from being my favourite. Me and sculptures in gardens do not usually get on. Most garden sculptures I do not like as they seem to be an intrusion in the garden, a distraction, and a tool to disconnect us from living things. Having said that, there were some garden sculptures at Bloom that I enjoyed,and I have featured some in this blog post. This garden served more as an outdoor sculpture gallery than as a garden. I wish I had taken a pic of the Children Of Lir sculpture though. This walled garden is a permanent feature at Phoenix Park, and it's as if the Bloom Festival is built around it. 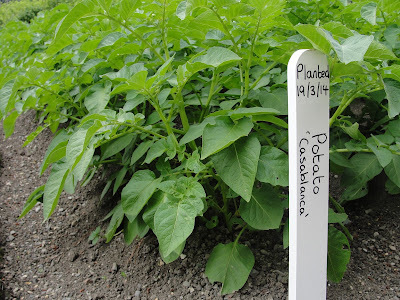 Every growing area was well labelled to provide information about the species and planting or sowing date. Several exotic fruit trees were pinned against south facing walls to encourage fruiting fruit from the southern heat. Large plots of green manure comfrey were there. There were also some wild flower plots, but I did not take any pics of those. Inside the garden walls was a Tree Council booth. The man there recognised Bards In The Woods from the National Tree Week, that the Tree Council put together in Ireland. Surprisingly, The Tree Council booth and Native Woodland Trust booth were the only representations of trees at Bloom 2016. I was surprised to not see Future Forests, or similar there, promoting food forests and orchards. Overall, a wonderful set of Show Gardens at Bloom 2016. It takes a good day to full observe them and have some understanding of what they are about. These gardens definitely presented something for everyone, They ranged from gardens that anyone could adapt to their own garden, onto the stunningly surreal.